December 14, 2012 / Astoria & LIC / Food in Queens / Queens Buzz. I attended a lecture on nutrition sponsored by Mount Sinai Hospital of Astoria at the LIC YMCA. 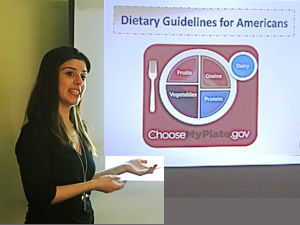 The presentation was given by Effie Nerantzis, Registered Dietician, who is shown in the photo to your left. She provided a lot of information that one can use to begin to make smart, healthy choices in their diet, while continuing to lead an on-the-go modern lifestyle. Some of the lecture including how to read nutrition labels on the backs of packages, how to interpret the claims on the front of food packages, she touched on how organic foods factor into the mix, and how to shop and prepare foods in short order. We'll have more on this seminar later in the quarter. 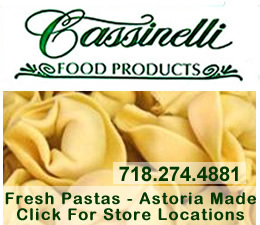 In the meantime, click here for other Astoria News briefs. 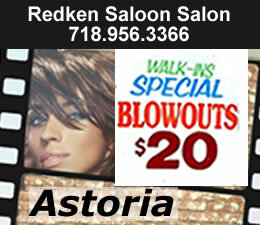 November 26, 2012 / Astoria & Sunnyside / Queens Neighborhoods / Queens Buzz. 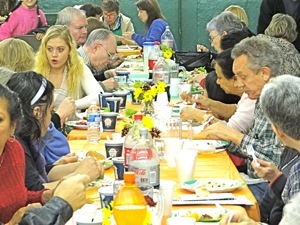 I attended a traditional Thanksgiving dinner on Saturday evening at the Sunnyside Reformed Church. It was an old fashioned community social, reminiscent of many years ago, when neighbors would get together in communal celebrations near the end of the year. In Astoria, I attended the Greek Homeowners Thanksgiving dinner on Thanksgiving Day 2011 in Astoria. The Greek Homeowners Association will be hosting their annual Thanksgiving Dinner 2012 this Thursday, the details of which we will include in the Social section of the events calendar [see Things To Do button on tool bar above]. Both Thanksgiving Dinners are free and open to the public. Sometime later I'll take you into these two celebrations, showing you both the food and the people, and trying to capture the spirit behind them. The photo above was taken at the Sunnyside Reformed Church on the Saturday before Thanksgiving. August 6, 2012 / Queens Buzz. As if it weren't hot enough this weekend, as highs hit the 90's and the humidity made some look as if they'd been out in the rain. 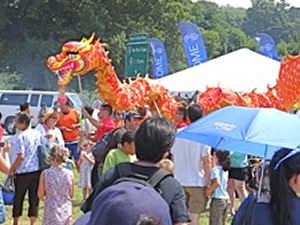 So I ran, fleeing the dragon at Meadow Lake in Flushing Meadows Corona Park, looking for some Asian food and a good place to watch the 22nd annual Hong Kong Dragon Boat races. 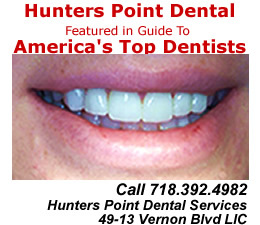 July 24, 2012 / Flushing / Queens Restaurants / Queens Buzz. I attended the Asian Food Expo in Flushing on Friday at lunch time. 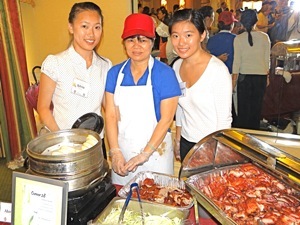 There were about a dozen and a half restaurants from the Flushing area participating in the event, which hosted hundreds of people to a sumptuous sampling of Asian delights available in Flushing neighborhood restaurants. 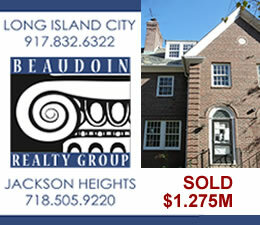 The Flushing BID [Business Improvement District] was the organizer of the event. Dian Yu, Executive Director of the Flushing BID, told us that the intent of the program was to show the world what great food is available in Flushing restaurants. He went on to talk about how Flushing has become one of the largest Asian communities outside of Asia, and hence offers visitors a chance to sample authentic Asian cuisine in a local neighborhood. August 13, 2012 / Astoria / Food in Queens / Queens Buzz. This weekend was the second of three Sundays where Shore Blvd is closed on Sundays from 1 pm to 7 pm. This has the effect of connecting the park to the East River waterfront. 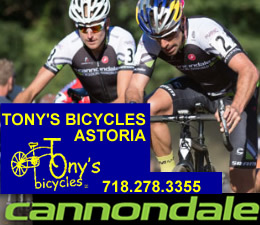 And the Astoria Park Alliance & Green Shores NYC, in tandem with the NYC Parks department, have put together a full schedule of family friendly fun & entertainment. The first weekend the program had a theme of things to do with the kids, this past weekend had a theme of tasting food of the neighborhood and next weekend it's going to be all about the music. June 2012 / Jamaica NY / Jamaica News Briefs / Queens Buzz. Community Markets Farmers Market in Jamaica opened this month. The farmers market provides local residents with an opportunity to purchase fresh vegetables, produce, eggs, poultry and meats raised by local New York / New Jersey farms. 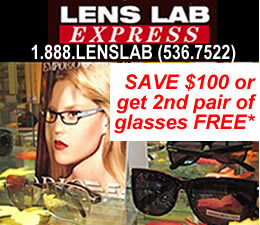 Many of the items sold also qualify as all natural and a few of the items are organic. The market also accepts food stamps, so you can cash your food stamps using your EBT card to get tokens you may use to purchase items sold at the farmers market. The market is open every Friday and Saturday from 8.30 am to 4 pm. The market will be open through mid November [11/16 & 11/17 is the last weekend]. 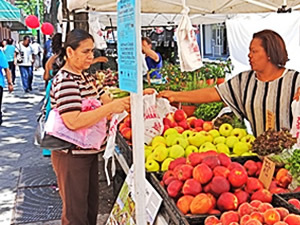 Click here to view a complete report on farmers markets in Jamaica & Queens. Eating To Live ... or Living To Eat? 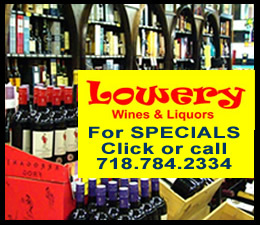 February 29, 2012 / Astoria / Food in Queens / Queens Buzz. I had the opportunity to attend a couple of programs sponsored by Mount Sinai Hospital of Queens about food and nutrition. The first I attended was a presentation given by Chef Rocco Sacramone of Trattoria L'incontro in the Ditmars neighborhood of Astoria. Rocco and Allison Caplowaith, Mount Sinai Clinical Nutrition Manager, collaborated in putting together a menu that met Rocco's taste standards and Allison's nutrition standards. During the presentation there was some jesting back and forth - as one can imagine - about whether we eat to live .. or live to eat. 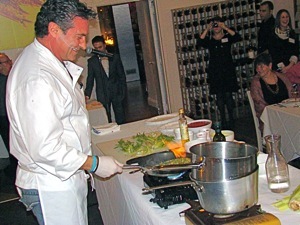 That's Rocco smiling as he prepares one of the items on the menu. We'll post more info and photos about nutritious and delicious food in Queens at a later date. 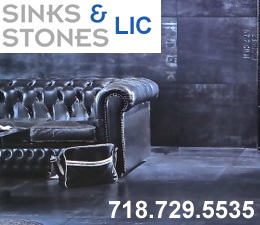 June 4, 2012 / Long Island City LIC / Long Island City LIC Restaurants / Queens Buzz. 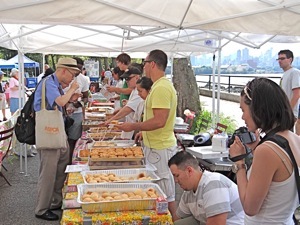 The 7th Annual Taste of LIC comes to Gantry Park Tuesday beginning at 6 pm. 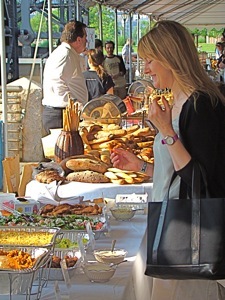 The fashionable food feast includes mouth-watering morsels from many of the surrounding LIC restaurants. 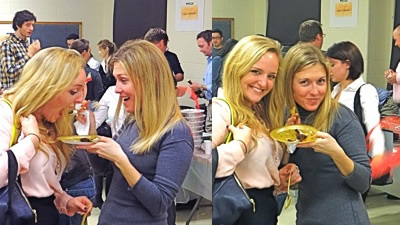 The photo to your right shows an attendee of the Taste of LIC enjoying one of the savory treats presented by local LIC restaurateurs. According to the weather forecasters there's a 20% chance of rain until about 4 pm at which time the chance of T-storms climbs to 30% chance of scattered rain. Winds will be blowing at about 10 miles per hour, and the temperatures will be in the mid 60's so a bit on the cool side compared to what we've experienced lately. 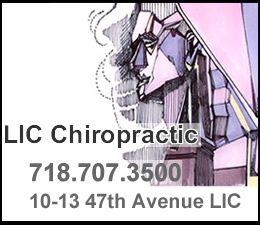 Proceeds from the event go to the Chocolate Factory which is an avante garde theater company in LIC. Advance tickets are no longer available, but we've been assured that you will be able to buy tickets [$60 & up] at the event. 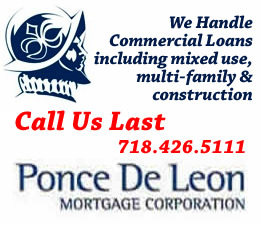 Click here to read our report on the Taste of LIC in 2011. 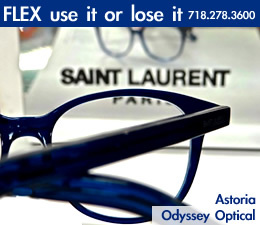 June 2, 2012 / Sunnyside News Brief / Queens Buzz. The seasonal Sunnyside Farmers Market opened today. The market provides a wide selection of fresh locally grown fruits and vegetables, baked goods including breads and pies, and wine. The market is located on the corner of 43rd Street and Skillman Avenue and will open every Saturday from 8 am - 3 pm until December 22nd, 2012. 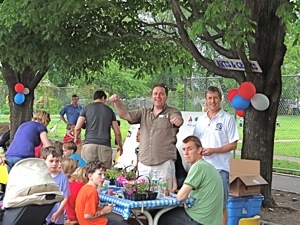 Click here to view a map showing the Sunnyside Farmers Market and click here to see a complete listing of the Queens farmers markets. 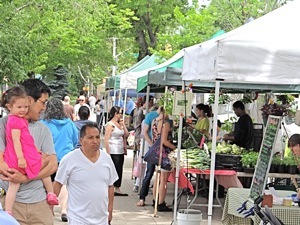 The photo shows the opening day at the Sunnyside Farmers market in 2012. May 26, 2012 / Sunnyside News / Queens Buzz. Sunnyside Gardens Park is a private park that opens its doors several times a year to the neighborhood at large. Memorial Day Weekend is one of those occasions when non-members can take an opportunity to experience the park. This year there were raffles, athletic activities for the kids like basketball and climbing, barbeque for the family, live music and some shopping opportunities. Hundreds of people came out for the occasion. After years of undersold capacity, Sunnyside Gardens Park [click here to learn more about Sunnyside Gardens Park membership] currently has a waiting list. But for those who want access to a park, nearby Windmuller Park in Woodside provides public access to a newly refurbished playground and also has a great lawn. July 24, 2011 / Jamaican Neighborhood / Fashion & Music / Food & Wine / Queens Buzz. I traveled down to the first annual Jamaican Jerk Festival having only an approximate idea of what to expect. I'd read about other Jamaican Jerk festivals and decided that the first one in Queens would be a good opportunity to check it out. Roy Wilkins Park is on the southern edge of the Jamaica neighborhood, accessible via the LIE or via the subway to Jamaica Station and then the number 5 or 85 bus down along Merrick Blvd. They had situated the festival around the southern edge of the park, where there are trees which provided much needed shade. My first stop was the cultural stage, where there music was played, models walked and wore new designs, and I saw Afro-Carribean dances performed. Jamaican jerk is a spicy hot culinary treat, generally added while the chicken or pork is simmering on the grill. 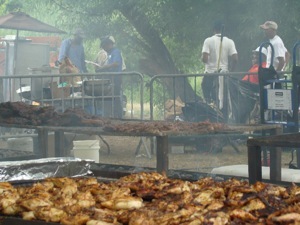 We'll post more about the Jamaican Jerk Festival, including a slide show of photos when time permits. July 7, 2011 / Jackson Heights Neighborhood / Queens Business / Queens Buzz. I attended a reception for a number of Costa Rican exporters given by the Queens Chamber of Commerce at the Bulova Corporate Center in Jackson Heights. I met with a number of them to find out what goods and services they were seeking to export to America and in the process learned a bit more than I expected about our prosperous Latin American neighbor which has become a mix of old and new over the past last half century. July 2, 2011 / Sunnyside Neighborhood / Food & Wine / Queens Buzz. I sauntered over to the Sunnyside Farmers Market Saturday morning to see what I might see. The market provides an assortment of fresh fruits and vegetables, baked goods, jams and dairy, and a number of garnishes. The Sunnyside Farmers Market is one of the GrowNYC markets. Grow NYC manages most of the Queens farmers markets but three are managed by another agricultural organization - Community Markets. Both organizations appear to sign up reliable, high quality food vendors. 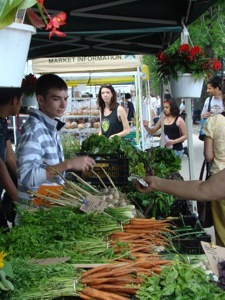 Click this link for a listing of the farmers markets in Queens. August 8, 2010 / Jamaica / Queens Buzz. 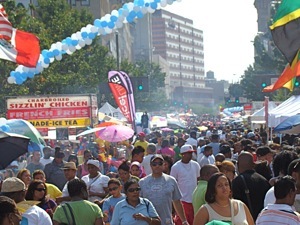 The JAMS Street Festival covers over 15 blocks and is one of the largest street fairs in Queens. We counted three stages upon which numerous live bands played a wide range of music including the Motown sound, Reggae, Afro-Caribbean, jazz and rock. Meanwhile the crowd consisted of a spicy mix of Caribbean, Afro-American, Indian and Middle Easterners. There were a number of street shoppers / browsers of European descent too. It has been estimated that over 10,000 people visit this street fair. And there's some spicy food that reflects some of the varied tastes of the ethnically mixed audience. May 24, 2010 / Astoria News Brief / Queens Buzz. This past weekend was near perfect weatherwise and everywhere we went, from Flushing to Astoria, people were out and about enjoying themselves. On Saturday we attended a conference hosted by the Chinese American Real Estate Association in Flushing where we went looking for information about the state of real estate financing in Queens. We stopped by the Bohemian Hall and Beer Garden in Astoria where an Astoria Music & Arts music fest was going on. 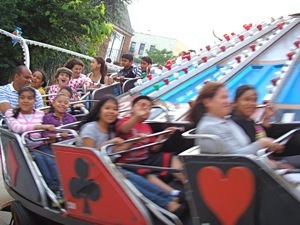 On both Saturday and Sunday we visited the Greek Festival in Astoria, where St Demetrios put on a good old fashioned fair, complete with an assortment of rides, prize games complemented by Greek food and music. Jackson Heights / October 2009. 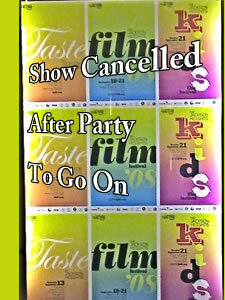 This year the Jackson Heights Film and Food Festival [hereafter referred to as JHFFF] did not take place. First there were difficulties obtaining access to the Eagle Theater, which had served as the host for the film portion of the program in 2008. Since they could not obtain a commitment for a date for the film portion of the festival, the JHFFF held off scheduling the food portion. 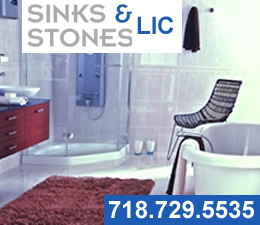 Fall 2009 / LIC News Briefs / Queens Buzz. This past weekend PS1 was host to a food event sponsored by Le Fooding, a french culinary guide which is working to make its way into the New York city market. Over the course of two evenings Le Fooding collaborated with three American and three French chefs to feed the roughly two thousand people who attended the event. 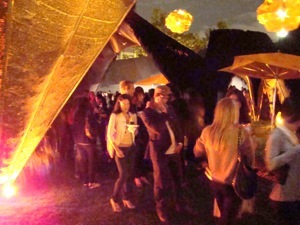 The event was held in the PS1 Courtyard which Le Fooding had covered with grass. The grass gave the PS1 Courtyard a nice warm plush feel. Le Fooding had also installed slide projectors which beamed graphics they created for the guide on the large courtyard walls. And, of course, in keeping with PS1 Warm Up Party traditions, they had a live DJ. 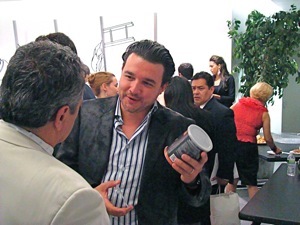 RSVPs were required to attend and the proceeds went to PS1 and Action Against Hunger, a non-profit group.